Hello and Welcome to Raring2go! 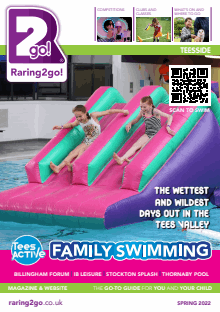 Teesside: the GO-TO GUIDE for you and your child in this area! If it's a day out, a new class or inspiration for a birthday party this website is full of ideas to help you. The Kids Zone has dozens of free downloads for rainy day activities and be sure to enter our fantastic competitions. Its free and only takes a minute to register your email address. You can also opt to receive our monthly enewsletter. Raring2go! magazine is delivered to over 20,000 local families. Click here to read the latest issue. Advertising with Raring2go! Print and digital packages start from just £25 a month.